We've talked before about using social media for knowledge sharing in a way that enhances your company's value and reputation. There's plenty of information out there about consumer marketing, but what about business marketing -- the right way? LeanCor, the logistics company, is using social media for both marketing and employee communication. I asked Kelley Dodd, Marketing Specialist, to give us a peek into what they are doing and learning and what it has to do with lean. KW: I see you recently joined YouTube - what led to LeanCor's decision to do that? KD: We wanted to create a more interactive experience for those engaging with our marketing content. Making things visible is a foundational concept in lean, so it only made sense to showcase our capabilities and tools through video. 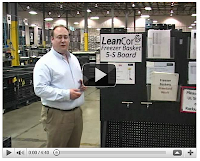 We just finished a corporate capabilities video, as well as some lean warehousing videos. YouTube provided a user-friendly platform with higher audience reach and exposure. KW: What are the purposes? What is the role of knowledge sharing? How does it contribute to marketing, if it does? KD: Because prospective customers are often seeking information about your industry, your business must produce content that is educational and builds trust. You want to provide value which will make visitors more likely to remember your business when seeking your products or services. Knowledge sharing will add to your credibility and position you as a thought leader in your industry. KW: How are you connecting customers and potential customers as viewers or subscribers to the YouTube channel? KD: In regards to YouTube, we are relatively new to the game. Just putting the videos out there has been our first step. In order to increase viewers, I link to our YouTube channel through other marketing outlets such as our website, e-newsletter, Twitter, and LinkedIn group. KW: It can be hard to get people to do these videos. How do you do that? Do you have any feedback from the guys who were involved that would motivate or challenge lean professionals in other companies to do similar videos? KD: One of the biggest challenges within our organization is to be on the cutting edge not only of lean, but creativity. Our goal in our facilities is to create the ultimate visual factory and we had the opportunity to showcase some of our lean tools via the videos. Another major reason for developing the short clips was to connect internally and share best practices. Not every LeanCor employee can be here on site in our facility and the more lessons, experiences, and tools passed on internally will only strengthen our company. Another tip is to find creative and different ways to produce the videos. Like producing other content such as blog posts, you want to find an interesting angle that will appeal to your audience. For example, we are going to film student testimonials at the upcoming course, Building a Lean Problem Solver, and the Georgia Tech Supply Chain and Logistics Institute. AME takes a similar approach in its attendee testimonial videos used to market the upcoming national conference. KW: How are videos produced? Professionals? Just other staff members? How do you set up for production? KD: Our videos are produced in house by our Creative Specialist, Liz Cooke, as well as program managers at our Lean Logistics Center. To set up our video production, we purchased a camera, tripod, and video editing software. We typically spend a lot of time planning out a video before shooting - writing scripts, drawing storyboards, and creating shot lists. KW: What help do you provide to the people making the videos? KD: In addition to group collaboration in the planning phase, our team members also take turns as actors, dolly operators, sound specialists and controlling the teleprompter. Although only one person is necessary to run the camera and edit the footage, it takes a team to help in all areas of video production. KW: If someone was totally unfamiliar with setting up channels in YouTube, what would you advise them to do? KD: Setting up and using a YouTube account is easy, and using a few simple guidelines anyone can be successful. • Choose a username that incorporates your company name and/or the products you represent. • Make your first 30 seconds exciting and draw your audience in. People will generally tune out of a web video quickly if they're not engaged. • When uploading your video to YouTube, fill out a concise and informative description. When searching for videos, users will see two things: a video still and the description. Make it interesting so people will click on your video. • Keywords are your best friend. Keywords are how search engines pick videos to recommend. In addition, after watching a video YouTube will offer suggestions what to watch next, these are based on keywords— so choose words that relate to every facet of your business and you can't have too many. However, don’t choose extraneous keywords that have nothing to do with your video. Your viewer will figure it out quickly and resent the misleading information. KW: You are using lots of other channels. Briefly, what is your approach to LinkedIn, Twitter, Facebook, blogs, e-newsletters? KD: We have a LinkedIn group called The Lean Supply Chain that just reached over 1,000 members. We use this group as a collaborative forum to share news, articles, events, job positions, and best practices. Supply chain professionals post inquiries about workplace topics and to gain insight from other members. We started the Lean Logistics Blog in January that now averages 2,500 view per month. Posts are written by LeanCor team members and posted every Wednesday. We use Twitter (@LeanLogBlog) to mainly promote the blog. The Lean Supply Chain Digest is our monthly e-newsletter filled with tips, tricks, news, and events. We recently started a series in the newsletter called The Adventures of Lynn Lean and Tommy Traditional. It’s a running story about two conflicting managers within the same company and their journey of continuous improvement. We just posted the first issue in July’s newsletter and are anxious to see readers’ responses down the road. We are not active on Facebook, as I do not yet see the value for B2B companies that do not offer product coupons/promotions. KW: What have you learned? Are you seeing results yet? KD: I have learned that social media and content marketing takes time and persistence. It takes time to grow a social media following – whether it be blog readers, Twitter followers, or LinkedIn group members. You need to be dedicated to constant content creation, engagement, and keeping current with industry. Social media is here to stay in the business world, and the logistics and supply chain industry is no exception. We have seen major growth in website traffic, database growth, and general network growth. Our current strategy seems to be working. Using social media to promote lean concept is interesting approach. So people are going to see that application of lean is not limited to only shop floor environment. SCG - That's a good point. Someone searching on a lean topic, finding a good video in a supply chain context, is going to see some new things about where it can apply outside the factory floor. The supply chain community and the lean community are beginning to link up very strongly, which is exactly what we've been needing. Thanks for reading the blog. You have properly noticed that the content is the main thing for YouTube. Whenever the person best perceives information visually it made him buy. Therefore, creating a website for the sale of furniture, I made every effort to ensure that the customer provided high-quality video of his products. Next, I just chose the right plugins to add the YouTube gallery https://elfsight.com/youtube-channel-plugin-yottie/ to the site (WordPress of the last update) and our users were able to evaluate all the advantages of the products, thanks to the fact that the video fully complied with their requests. So, this is exactly working.